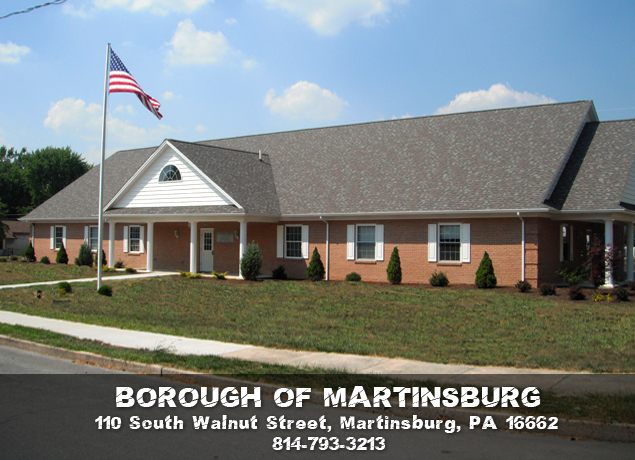 The regular meeting of the Martinsburg Borough Council was held on Monday, October 3, 2011, in the new municipal building located at110 S. Walnut St. The meeting started at 7:00 p.m. with prayer by Randy Stoltz and the Pledge of Allegiance. Andrew Katz, representative of the Blair County Chamber of Commerce Legislative Action Committee, spoke with council regarding municipal cooperation. He wanted to make council aware of his committee’s efforts and would like Martinsburg to get more involved. There are twenty-four boroughs and townships involved in the committee. He was not asking for financial contributions just more input. He’s hoping to start up meetings in the next 3-4 months. The MINUTES of the regular meeting of September 6, 2011, were approved correcting the Chief’s report that the earthquake was on August 23 (not September 23) on a motion by Linda Smith, seconded by Doreen Easly. The motion passed unanimously. The FINANCIAL AND TREASURER’S REPORTS were presented for September 2011 as written. The LIST OF BILLS for September 2011, check nos. 6167-6194 in the amount of $108,900.47, was approved on a motion by Doreen Easly, seconded by Suzanne McNally. The motion passed unanimously. Chief Kerry Hoover presented the police report as written. The police department as well as District Magistrate Ormsby has been extremely busy lately. Chief Hoover received a visitor the other day from Blair County Business.com – they have our police department listed on their website free as a courtesy to government agencies. A man has been arrested for stealing entire cash registers from small businesses. When the rash of burglaries first started the businesses had started a call chain which helped track the robber’s route. The State Police even had their helicopter out to help get the man the day he was caught. Doreen Easly reported that some of the Mennonite girls at the Spring Farm Greenhouse were being harassed, but they are out of Martinsburg Borough’s jurisdiction – it took over one hour for the State Police to respond to their call. Chief Hoover was commended for helping out with parking for the September 11th Memorial Service at the park. Manager Randy Stoltz reported that a Swiftreach call was made on September 28 to inform everyone on our water system that the nitrate levels in our drinking water are now safe to drink – this call was mandated by DEP; the annual Community Fund drive letters were stuffed into envelopes on September 29 for their annual mailing – this year’s goal is to reach $39,450 in donations; completed an online survey for the South Central Counties Boroughs Association regarding unfunded mandates – DEP requires a lot of online reporting with is very costly; sent an email to Representative Jerry Stern asking him to vote to increase the prevailing wagerate and also asked him to consider exempting road surfacing projects from the prevailing wage rate requirements. Secretary/Treasurer Jane Stailyrecommended that a budget workshop be set. The date chosen was Tuesday, October 18, at 6:30 p.m.
Attorney FrederickGieg, Jr. reported that he worked with Secretary Jane Stailyon getting the ordinance regulating insurance proceeds for damaged properties advertised for consideration for adoption this evening. Council on a motion by Suzanne McNally, seconded by Doreen Easly, adopted Ordinance No. 2011-583 Regulating Insurance Proceeds as they relate to damaged property in the Borough of Martinsburg. The motion passed unanimously. Attorney Frederick Gieg, Jr. reported that he was scheduled to meet with Andrea Cohen on October 19 at 1 p.m. to discuss bringing the throughway beside the Riverside grocery store up to borough standards. The Cohens were thinking that this may be a good time to fix it up since they want to sell the property. Attorney Gieg suggested the borough come up with a cost figure to repair it to present to the Cohens. The borough may wish to consider taking it over as an alley. Manager Stoltz is scheduled to meet with PennDOT on October 5th to discuss it before meeting with the Cohens. Attorney Frederick Gieg, Jr. also reported that he also met with Chief Hoover to give him an opinion on an issue that he had. Connie Lamborn wanted to remind residents to obey the snow emergency signs during the winter. Suzanne McNally reported that various shrubs were planted around the borough building signs and flag pole on September 21, 22 and 27. Martinsburg Borough will be hosting the South Central Counties Boroughs Association dinner meeting on October 5. She encouraged everyone to attend and to fill out their meal choice on the registration form in the council packets. Ed Bennett reported that a pothole onHighland Street was repaired. The newMarathon 65 crack sealing machine should be arriving on October 5. Durban Metzler was unable to attend the last municipal authority meeting on September 15. Suzanne McNally reported that tickets will be available for the Martinsburg Fire Company’s chicken barbeque at the park on November 5. Linda Smith reported that the Revitalization Committee met on September 26 here at the new municipal building. Clean up day will be October 5 to replace the flowers. The committee would like to use the borough truck that day to pick up all the debris. Linda inquired if the borough crew could trim the shrubbery at the old municipal building. Manager Stoltz informed her that the new owners are now responsible. The new owners are currently in the process of trying to get all of their renovation permits so it may be a while until they can start working on it. The committee will meet again on October 31. They are hoping Jessica Sheets will attend. A letter was sent to Meals on Wheels informing them of council’s denial of their request to use the new municipal building for their distribution center. The draft flood plain ordinance has recently been returned with FEMA’s recommended changes. Their requested changes will be incorporated into our draft ordinance before returning it back to them for final review. Council can consider the new earned income tax ordinance for adoption once it has been properly advertised by the county. Council still needs to determine the species of trees to purchase and how they want them planted. The topic was tabled until Manager Stoltz gets Ken Ake’s opinion on the matter. Penelec recommends planting small urban trees so they don’t grow into their overhead electric wires.Durban recommended contacting several other landscapers for their design ideas before deciding on the species and location. It will be looked at again at the end of the year for possible planting in the spring. Dogwood trees were also suggested. Chief Hoover will get a cost for the new radios to Jane Staily for inclusion in the draft 2012 budget. More information will be needed from PMRS before council can comply with their recommended Killed in Service policy changes for the uniformed pension plan. It was the consensus of council to allow Manager Stoltz to try again to get a grant for the comprehensive plan. The last plan updates were made back in 1972. A real estate assessment appeal request for Angela Diehl is scheduled for October 19. Attorney Gieg recommended waiting until we see what they are planning to reduce it to before deciding to appeal the appeal request. Manager Randy Stoltz, also zoning officer, prepared a list of zoning procedures to give council a better understanding of how it all works. Trick or Treat night was set for Thursday, October 27, 2011, from 6:00-8:00 p.m. Most of the county is planning to have it that same evening. Chief Hoover extended an invitation to council if they wanted to volunteer to help patrol the streets that evening along with the firemen and fire police. All volunteers are to meet at the firehall at 5:30 p.m. that evening. The meeting adjourned at 8:15 p.m. on a motion by Doreen Easly, seconded by Suzanne McNally. The motion passed unanimously.